Choose a rock that you can lift easily. Before picking it up, notice that if it is not underwater, buried, or rolling downhill, it is, in fact, already balanced where it is. To change how and where it is balanced, pick it up and then put it down in a new position. 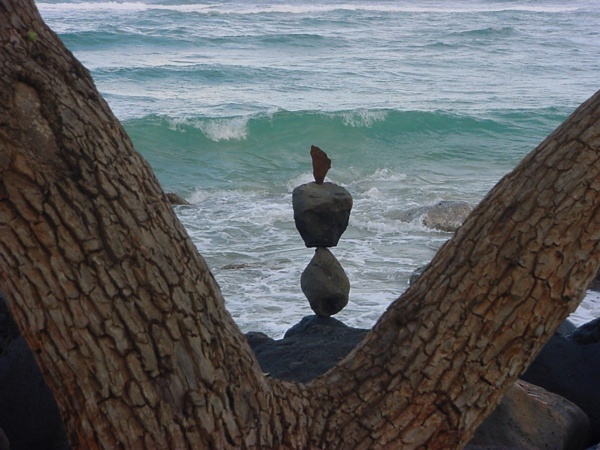 Even if it falls over, it will come to a balanced rest, often as it was balanced before, but sometimes not. 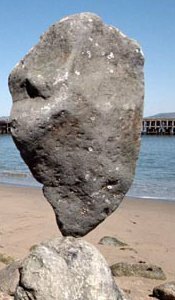 If you wish it balanced on a side it does not readily choose itself, you need to be more observant and precise than the simple re-balancing of step 2, and will have to look at the rock carefully. Try to find a flat spot on the side of the rock you want to be the "bottom", and set it down on that. If it falls over (or would want to, if you let it go), try to find a rock to put it down on which tilts the other way. Choosing where a rock is balanced is very important. Each time you try to rebalance a rock, try a smaller and smaller spot as the new bottom. If it curves out, find a curved-in spot on the base rock to set it on. If it's curved in, find a little bump. The two surfaces should have the same size, shape and slant. The smaller the bottom, the more striking the new balance appears to be. The larger the rock itself is, the easier it is to find the right slant to set it on. Rough rock is better; friction is your friend; keep trying. It was balanced when you started. You and the rock need to agree. Often the slightest nudge or repositioning will make it happy and stable (for a while). Before walking away, consider whether others will be potentially pleased or harmed by encountering your efforts. Bill takes his down at the end of the day.